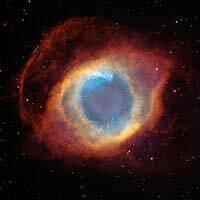 Here is a photo of the Helix Nebula, defined as a cloud of dust and gases in the universe. It is also known to some as “The Eye of God”. I’m wondering if Bette knew anything at all about the Helix Nebula when she recorded her famous hit, or if it’s just another of God’s wonderful ways of making himself known on our planet. The simple complexity of it all is a wonder in itself. TYG. This entry was tagged awards, Bette Midler, Eye of God, music, nebula, songs, universe, wonder. Bookmark the permalink. Nice post there, love the photo! Best wishes for your blog! Visit mine, maybe you’ll enjoy as I enjoyed yours! https://thebeautyofspace.wordpress.com/ Cheers! Thank you. I took you up on your invitation … Very interesting and informative. I like it! Amos 5:8. Thank you, Steve.